A NEW Men’s Clothing Superstore Has Arrived! DXL Is Now Open In Cheektowaga! The ultimate one-stop shop for men who wear waist 38+ and size XL and up. Our customers seek choices, value, convenience and a unique shopping experience, which DXL stores offer. Before DXL, these guys were relegated to shopping at the end of the rack in department stores. 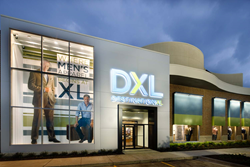 Destination XL Group, Inc. (Nasdaq: DXLG), the leading retailer of men's XL apparel, has opened a new store in Cheektowaga, NY, on 2015 Walden Ave.
For guys who wear XL sizes, finding quality clothing that fits right and looks stylish has been a struggle. Until now, they had no other options than to shop at department stores that carry a limited selection of styles in their sizes. DXL makes it easy and convenient for guys to look and feel their best. And if you’re a Buffalo Bills fan, this is one reason to get your NFL on early. Carrying a variety of Bills’ gear to get you game-day ready, DXL is also a one-stop shop catering to the clothing needs and lifestyles of men in New York who are waist size 38+ and size XL and up. The store atmosphere is unique, built just for men, with a more spacious environment and outstanding service. Styles from over 100 brands and top designers such as Polo Ralph Lauren, Michael Kors, Lucky Brand Jeans and Lacoste. Brands exclusive to DXL in XL sizes like Brooks Brothers, Robert Graham, DKNY Jeans, Twenty-Eight Degrees, Society of One and True Religion. Everyday values on all the essentials, plus current trends to fit all aspects of a guy’s lifestyle. Fashion experts on hand to help guys find the perfect fit, plus on-site tailoring services. Sizes starting at 38” waist or XL including tall sizes, plus extended shoe sizes. The one-of-a-kind experience carries through to DestinationXL.com where customers can access an even greater selection directly from the website through their computer, smart-phone or tablet. They can also verify if a product is in stock at their local store or select to have online purchases shipped to a local DXL store for free. Destination XL Group, Inc. is the largest retailer of men's apparel in sizes XL and up, with operations throughout the United States and in London, England. The company is currently in the process of transitioning from Casual Male XL to focus primarily on the DXL concept. Subsidiaries of Destination XL Group, Inc. currently operate Casual Male XL retail and outlet stores, Rochester Clothing stores, DXL stores and e-commerce sites, including DestinationXL.com and mobile site m.DestinationXL.com. DestinationXL.com offers a multi-channel solution similar to the DXL store experience with the most extensive selection of online products available anywhere for the XL guy. The Company is headquartered in Canton, Massachusetts, and its common stock is listed on the NASDAQ Global Market under the symbol "DXLG." Sizes start at 38” waist or XL including tall sizes, plus shoe sizes 10-16, in widths to 4E.